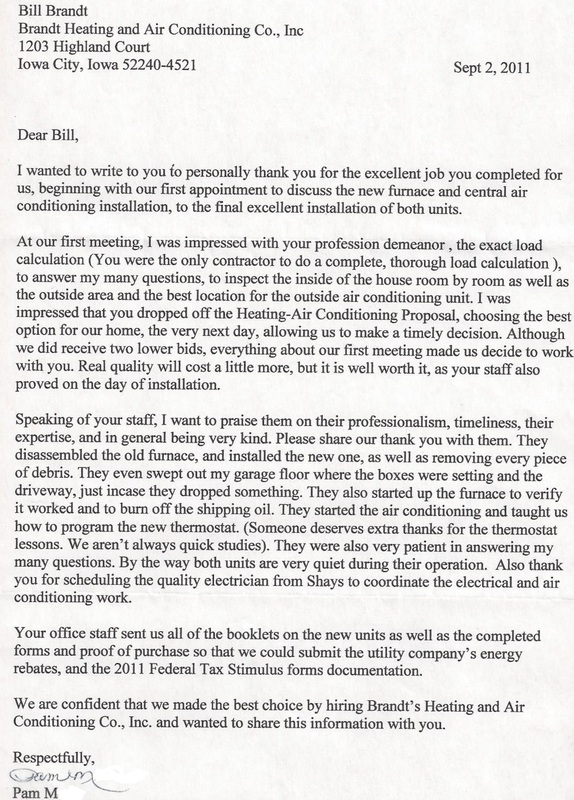 I wanted to write to you to personally thank you for the excellent job you completed for us, beginning with our first appointment to discuss the new furnace and central air conditioning installation, to the to the final excellent installation of both units. At our first meeting, I was impressed with your professional demeanor, the exact load calculation (You were the only contractor to do a complete, thorough load calculation), to answer my many questions, to inspect the inside of the house room by room as well as the outside area and the best location for the outside air conditioning unit. 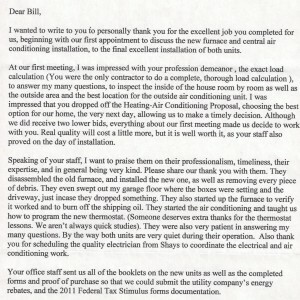 I was impressed that you dropped off the Heating-Air Conditioning Proposal, choosing the best option for our home, the very next day, allowing us to make a timely decision. Although we did receive two lower bids, everything about our first meeting made us decide to work with you. Real quality will cost a little more, but it is well worth it, as your staff also proved on the day of installation. Speaking of your staff, I want to praise them on their professionalism, timeliness, their expertise, and in general being very kind. Please share our thank you with them. They disassembled the old furnace, and installed the new one, as well as removing every piece of debris. They even swept out my garage floor where the boxes were setting and the driveway, just in case they dropped something. They also started up the furnace to verify it worked and to burn off the sipping oil. They started the air conditioning and taught us how to program the new thermostat. (Someone deserve extra thanks for the thermostat lessons. We aren’t always quick studies.) They were also very patient in answering my many questions. By the way both units are very quiet during their operation. Also thank you for scheduling the quality electrician from Shays to coordinate the electrical and air conditioning work. Your office staff sent us all of the booklets on the new units as well as the completed forms and proof of purchase so that we could submit the utility company’s energy rebates, and the 2011 Federal Tax Stimulus forms documentation. 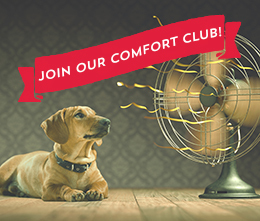 We are confident that we made the best choice by hiring Brandt’s Heating and Air Conditioning Co., Inc. and wanted to share this information with you.